Welcome to Colophon Book Arts Supply! Find all of your book arts supplies by clicking on "SHOP" above, or by clicking on any of the shop sections here. International orders should be placed via email. 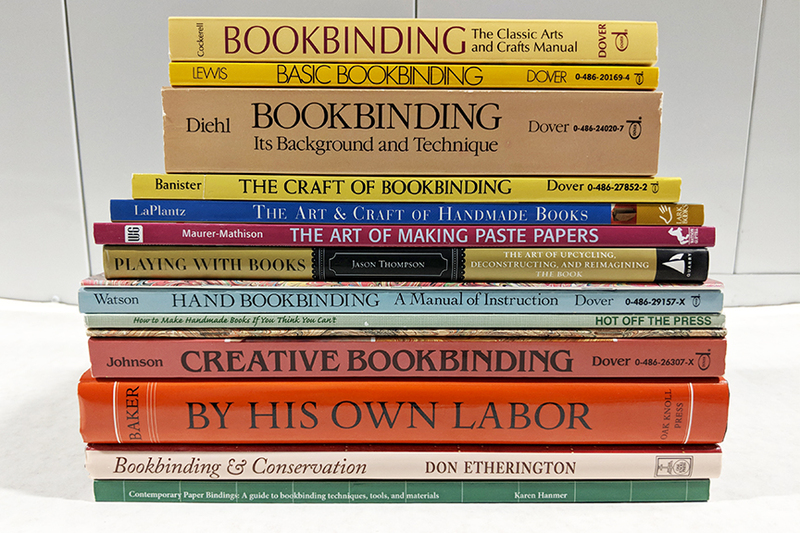 Here you can find resources for bookbinding, book arts, book history, marbling, and more! These are just some of the items in the shop! This section includes wooden boards, binder's board, bookcloth, and a variety of papers. Find all of your binding needs here including knives, rulers, bonefolders, threads, and much more. Pictured: hahnemuhle ingres antique, colophon's best 18/3 natural, M.D.P. flax cord 8/8. Photo and text block by Brien Beidler. Shop here for your tanks, chemicals, colors, and other tools to create your beautiful designs! This part of the shop incorporates a collection of tools and supplies like pin clips, printing supplies, and other book arts accessories. Click on the image to the left or visit the "Miscellaneous Tools & Supplies" section of the shop! Paper and Book Intensive!!! May 12-23, 2019. Book arts, amazing people, inspiration, lagoon, toast. There isn’t much more I can say about this. Focus on Book Arts. June 26-30, 2019. This conference is a total immersive book arts experience and I am really looking forward to coming back to this great group of people! FOCUS ON BOOK ARTS is a five-day conference of book and paper arts workshops held biennially on the verdant campus of Pacific University in charming Forest Grove, Oregon, just west of Portland. Every odd-numbered year, we present workshops taught by renowned, professional instructors in the fields of bookbinding, printing, decorative papers, paper making, book art and more.